2015 Kia Picanto 1.0 SR7 3dr review | What Car? 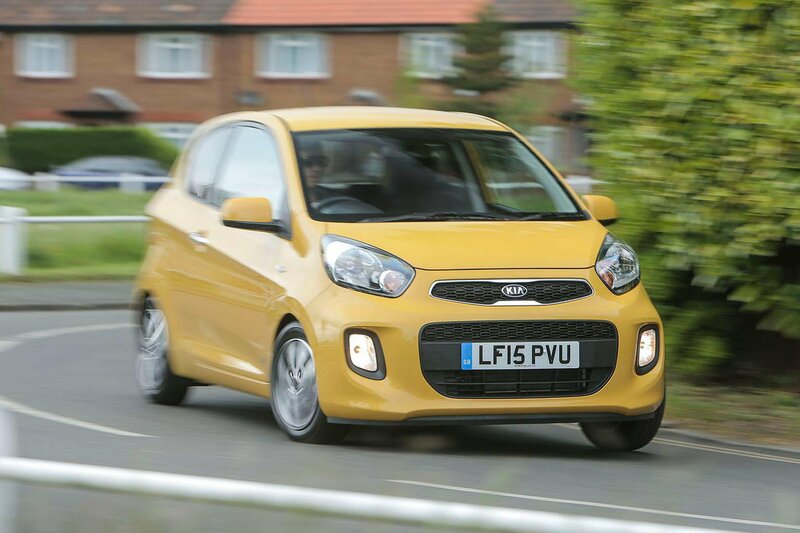 The Kia Picanto has undergone a facelift for 2015 to help it keep up with the most popular models in the city car class. This SR7 version of the Picanto is pitched just above entry-level 1 trim and costs £9845 for the three-door version and £10,045 for the five-door. It replaces the pre-facelift model's VR7 trim and comes with a bit more kit but the same 68bhp 1.0-litre petrol engine. The city car market is dominated by models such as the Volkswagen Up, Hyundai i10 and Skoda Citigo, so where does this revised Kia Picanto sit among its rivals? What’s the 2015 Kia Picanto SR7 like to drive? Unfortunately, many of the annoyances from the previous generation remain in the facelifted model. The engines from the last model are carried over. This means that Kia's 1.0-litre petrol is still disappointingly underpowered and pretty uninspiring to use. In built-up areas this is less of an issue - aside from a relatively short clutch travel and shallow biting point. The throttle response is adequate and the claimed fuel economy of 67.3mpg means that, even if you’re battling through traffic for much of your journeys, it won’t have a detrimental effect on your bank balance. It’s road tax-free, too, thanks to CO2 emissions just sneaking under the 100g/km mark at 99g/km, but it's lacking a stop-start system to improve economy further. So it's capable around town, and its five-speed gearbox is precise and accurate, but once you take the Picanto out of its natural urban habitat, the engine’s shortcomings become noticeable. If you’re in a rush on the motorway, it's very difficult to make any progress quickly, even with a heavy right foot, and a whining rattle from the engine lets you know that you're working it hard. The ride also becomes unsettled at higher speeds, and you’ll find yourself regularly correcting the steering to keep it in a straight line. True, city cars aren’t suited to regular motorway trips, but rivals such as the Skoda Citigo deal with high-speed, lengthy journeys far better than the Picanto does. What’s the 2015 Kia Picanto SR7 like inside? Its ride may be disappointing, but the new Picanto's cabin is more impressive. It’s as plush as the previous generation's was and aside from some cheap-feeling switches and controls, it compares well with other cars in the class. Remote central locking, 60/40 split/folding rear seats and tinted glass come as standard on all Picantos, and SR7 adds a few luxuries like air-con, steering wheel-mounted controls, electric front windows, Bluetooth, USB, aux ports and rear parking sensors. The audio system has also been upgraded, but its sound quality remains below par. There are a few nice cosmetic touches in SR7, though, such as the leather steering wheel and gearstick. Space-wise, it’s pretty tight in the back but can still accommodate two adults for short journeys, while the 200-litre boot is marginally bigger than that of a Citigo, Peugeot 108 or Citroën C1, but it lags behind the Hyundai 10’s class-leading 252-litre load space. Annoyingly, though, when you drop the front seats forwards in the three-door model to allow passengers into the back, it doesn't return to its original position when you put it upright again. This means that whenever you let someone into or out of the back of the car you have to spend a bit of time adjusting the seat again once you get in. If you’ll be carting people around regularly, we’d definitely recommend spending the extra £200 for the five-door version. With this engine and trim combination, the new Picanto proves to be a well-specced car with a decent interior, but its shortcomings on the road will make it frustrating to live with on a daily basis. You’re better off looking for a mid-spec alternative like the Hyundai i10 or Volkswagen Up. They may not offer quite such an impressive equipment list, but they are both slightly cheaper and are far better to drive. The refreshed Picanto carries on in the same vein as the model it replaces, which is both good and bad. Ultimately, however not enough has been altered to recommend it over its rivals.